IT is no longer just a tool for businesses to utilize. Technology has become an integral part of most companies’ daily operations, making it necessary for industries in today’s world to utilize IT if they want to get ahead of their competition and achieve their goals. However, it’s not easy to constantly maintain and update your technology systems. As a business, you have a countless number of other things to worry about first. However, you can’t ignore your IT because if your system goes down, most of your operations will go down with it and you’ll have to halt everything you’re doing until it’s back up again. What is the solution to all of this? RedNight Consulting can relieve you of all your IT worries. As a managed service provider (MSP), we’re ready to provide you with the affordable and proactive IT services your business needs to strategically succeed. We’ll take care of your technology so you don’t have to. One of the biggest benefits of turning to an MSP is how we take over the IT workload for you and allow you more time to focus on what’s really important – your business. The nature of our services is what allows you to save so much time. With MSPs, we’ve completely ditched the previous reactive, break-fix approach to IT and adapted proactive services. Why? Well, the reactive approach just isn’t effective. The break-fix approach is when an IT specialist reacts to an issue after it has already happened and caused damage. This means your business operations have already had to pause and wait for professional help to get back up and running. This is problematic for two – out of many – reasons. First, nothing halts productivity more than downtime, and the reactive approach allows for a lot of downtime. Secondly, an IT infrastructure is very complicated. For example, if you’re addressing a pipe burst reactively, the worst that could happen is some floor or water damage. With IT though, you could experience anything from data loss to lost contracts, or worse. This is why we’ve adapted the proactive approach. We can still operate in the break-fix model if required, but our proactive services make sure we never get that far. These services monitor, maintain, assess, and proactively scan your network 24/7/365 for any potential dangers. Once we detect a potential issue, we immediately address it from our remote location. This is beneficial for multiple reasons. First, with this constant monitoring, your system will always be up and running, drastically reducing your risk of downtime. Secondly, this remote maintenance and support will save you the costs of having to roll out a specialist to your location and pay them by the hour to address what could have been prevented. To sum it all up, managed IT will help you stop overworking, allowing you to focus your time and energies for efficiently and productively. Hourly IT work can get expensive. As we mentioned in the previous section, proactive services prevent that as much as they can. How are these proactive services charged though, and what exactly is offered in an MSP bundle? The way MSPs work is that we’ll assess your infrastructure first and see what services you need/could use efficiently. This can range from cloud services, VoIP, network security services, cabling…the list goes on. After our assessment, we’ll create a custom bundle for you, and this is charged at a flat, monthly rate. This method of billing is incredibly important. Why? Well, it makes budgeting a lot simpler, allowing you to strategically control your IT costs and allocate your bills where they need to go. The days are over of you having to deal with those unexpected, breakfix costs. 59% of businesses switch to managed IT because they see it as a cost-saving tool, and not only that, but managed services also provide maximum quality results, with 21% citing quality improvement as their reason to switch, 19% citing skill access, and 11% citing financial flexibility and market time. 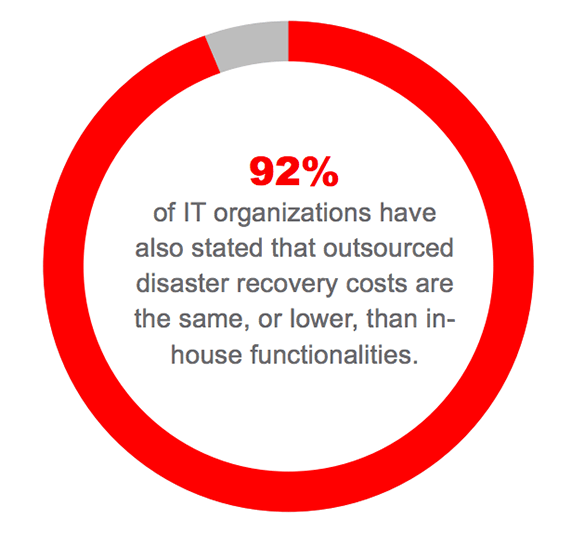 92% of IT organizations have also stated that outsourced disaster recovery costs are the same, or lower, than in-house functionalities. That’s a pretty significant statistic. With an MSP like RedNight, services aren’t the only thing you’ll be receiving. You will also gain a strategic partner with us, someone who will really take the time to learn your business and help you strategize your technology in the best way to achieve your goals. We will also make sure you’re covered in various areas of technology, such as regulatory compliance and/or disaster recovery and backup. The care doesn’t stop there. We’ll also frequently test your backups, document your network, log all your passwords, and track trouble tickets over time to spot trends. Our professionals are also available to you at our 24/7 help desk for any questions, issues, or requests you may have. We’ll be everything you need and more when it comes to IT. Technology is important for any business out there in this gadget-filled era, but it’s tricky. IT is a complicated topic that’s hard to fully understand unless you’re a professional. With the additional assistance and perspective that comes with managed IT from an MSP, it would be almost foolish not to make the transition. If you’d like more information and/or are ready to make the switch, contact us today. We’d love to meet you!